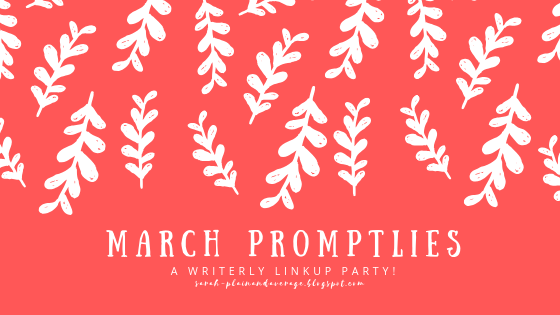 A note on the odd numbering of this post: I had planned to participate in March Promptlies last week, but none of my ideas worked out, so I’m numbering this entry to match with the number of the week’s writing prompt! You can find out more about the linkup and join the fun over at Sarah’s blog! Unlike Glitter, today’s bit of flash fiction is on the darker side of things and features a character from an existing novel. 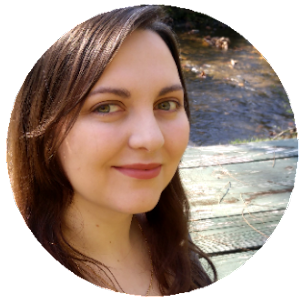 Albion Daye is from my NaNoWriMo 2016 project, a historical scifi titled Tolling Bells. The prompt worked so well for the character that I couldn’t resist! So this sequence is a bit weird and a little disjointed, but Albion’s point-of-view is always an interesting one to write from, and I had fun revisiting Tolling Bells for a little while to explore some of his Sad Backstory. 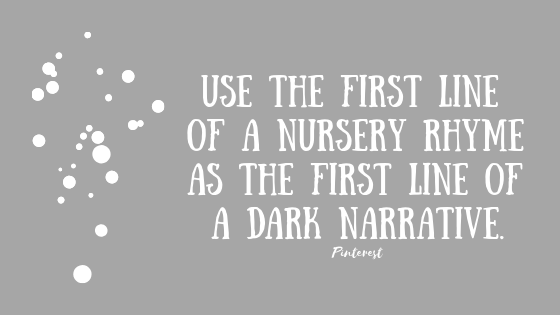 Use the first line of a nursery rhyme as the first line of a dark narrative. I chose the “One for Sorrow” rhyme. He tasted as much as heard the metallic strike of the shovel breaking ground and hitting against a stone, the coppery tang of it filling his mouth as he breathed in the heavy night air. He’d done this thousands of times—drawing out clumps of dirt and setting them aside until the ground reshaped beneath his feet and formed walls at his sides. The coffin’s occupant wasn’t the first to enter the grave, though they would be the last by the time all was said and done. The worn handle of the shovel slipped against his calloused palms and disrupted the rhythm into which he’d settled. A curse slid easily from his lips and a whispered apology followed it. Some habits were hard to break, but the excuse seemed weak when one was standing on sacred ground. He leaned a moment against the shovel, squinting at the silhouettes of gravestones in the fog, and shifted his gaze from the row of stone lambs a few paces away. He’d never lost a child, but the sight of the lambs guarding those who would forever be young pulled at some shadow in his thoughts. A few more hours’ of digging, and then he’d be on his way home. Little voices would greet him, a precursor to rapid tales of the day’s events while he’d been away, all crammed into the space of a few moments between dinner and sleep. His wife would greet him with a kiss on the cheek and wait until the children were nestled into bed before joining him by the fireplace to tell about her own day and to listen for some story of his own. The shovel struck another stone. Echoes cut through the fog. A whisper of something. He braced his weight against the shovel, pressed his boot heel down on it until the edge of the blade cut into the moist earth. The echo came again. His name, his wife’s gentle whisper. He became another statue, clad in dark, dirt-stained clothes in contrast to the stone and moss creatures around him. His breath hitched. All around him was fog and gray-tinged darkness. He squeezed his eyes shut, tightened his hold on the shovel’s handle. Please leave me be. It was a prayer, a plea he could no longer distinguish from thought or spoken word. The damp earth caught him as he fell to his knees, still clutching the shovel with one hand while his other palm brushed the cluster of dirt nearest him. The word was a jolt, no longer the voice of a ghost but of someone else, someone clad in black and standing before him. A familiar face. A name he knew but couldn’t recall. He looked down at his own clothing—once black but now faded to almost-gray—and started forward across the damp ground. How many times had he walked here, not knowing what this place would be? Calloused hands shaking, he made the procession to the graveside and joined the others come to mourn: his fellow gravedigger, standing next to him; the neighbor woman who sometimes watched the children; and lastly, the reverend, clutching the book in one hand and waiting for the last remaining family member to arrive. He was the one remaining member. The bereaved. Bereavement felt like numbness. Grief felt like a dream, something he was drifting through and waiting to wake from. He shut his eyes against the pale sunlight, waited for the sound of their voices drifting through the fog to pull him back to reality. Except how could it be real? His wife had never walked across the graveyard to whisper his name and reach a too-pale hand toward him. His children never chased each other around the maze of stones. What he’d seen—it was a dream, a memory that felt like premonition. By some miracle, he was still standing, looking down at the fresh dirt before him. Another bit of earth that would soon look like all the rest, another grave in a mass of others too poor or unknown for anything else. What wouldn’t he give to not be standing here? What wouldn’t he give to have them back, to be walking home from a long day’s work and find them waiting by the hearth with their smiles and their stories? He had not been the one to dig the graves before him, but he knew the task so well that it was all he could see. All he could hear was the singing of the metal and the rhythmic landing of the dirt on the ground in a pile. By the time he realized he was now alone, he was kneeling on the wet grass beside the slight mound of dirt, turning a smooth stone over and over in his hands. Somewhere the chirping of a bird faded away to the silence of night, leaving him with nothing but the sound of his heartbeat and breathing. Only his own pulse and breath, and neither brought comfort. So fragile, life. Such a mystery. How quickly it came into being and how quickly it was taken away. Because that was the only word to describe them. Lost was the word he kept for himself. He reached forward and nestled the stone in dirt, then drew out two others from his coat pocket and settled them beside the first. Far from proper gravestones, but they would have to do. A stone for each, to mark their memories, for remembrance was all that remained. 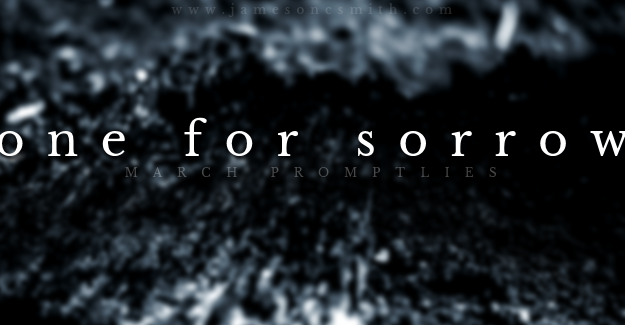 Are you participating in March Promptlies? Ooooh my goodness. *clutches heart* This was SO deliciously chilling. And SAD. The poor man. D': My heart BROKE for him. The whole haunting setting and his sorrow were so alive. I felt like I was THERE. This was absolutely phenomenal! *weeping* This was so beautifully haunting! I loved the twist in that it was his FAMILY TT_TT This was so beautifully written, the words & descriptions were perfect for this prompt! Thanks so much for joining in!! Oh, thank you so much! ^_^ I've been working on some new ideas for this novel and this prompt was SO PERFECT for this character and dipping back into the story for a little while. I'm having so much fun with the linkup! Blogaversary Q&A Call for Questions!